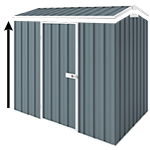 The Suncast Storage Sheds are made of weather resistant, Durable High Impact Polypropylene Resin which includes a special UV Sun Protection and are easy to assemble. This model has a 1.08 cubic metre capacity and comes in Light taupe colour. It is perfect for storing bins, lawn and garden products or sporting goods. The 2-door front panel comes with padlock hasp and ramp; and the lid can also be lifted up with a holding rod. This model can also accommodate wood shelf. This light weight super tough storage shed comes with a FLOOR. FREE Home Delivery Australia Wide!